If you asked me what my best performance was in 2011, I would immediately respond with the Miwok 100K. It was one of those rare days where everything seems to go right. My pacing had been perfect, I felt strong all day, and I finished faster than I thought I could. I knew, then, that a return to the same race would be very unlikely to produce a similar result. But as it turned out, Miwok 2012 wasn’t the same race at all. The most significant change was the increased elevation gain of about 2,000 feet. This included an equal increase in descent. Rumors also had the course at about a mile longer than in previous years – not really significant on its own, but enough to knock back your finish time a bit. The most obvious changes were the relocation of the start/finish area to Stinson Beach and the 5:00 A.M. start time which would have us running in the dark for the first hour. For my part, I also planned to approach this race differently than last year. My primary motivation for signing up for it was to get in a 100K training run for Hardrock. With that in mind, I executed what has been my typical spring race plan this year by skipping the taper and getting in plenty of miles in the days leading up to the race. Race morning found me cruising down an empty Highway 1 at 4:00 A.M, light from the supermoon reflecting off the ocean. I arrived in time to briefly greet a few friends at the start before we all donned our headlamps and took off through the streets of the tiny, oceanfront town. The morning was warm enough to start in my tank top – no long sleeves required. The first thing I noticed was how light and free I felt. The pockets of my tank top were empty. Oh crap! I forgot all my food! Ten seconds into the race, and already I was in a panic. I had a Mojo bar and a stash of chews and waffles for my pockets, but they’d all been forgotten in the backseat of my cluttered Subaru. I sighed. It would have to be aid station GU’s for my pockets, then. What do you think? Ultrarunning doppelgangers? I know – it’s mostly just the pigtails. We soon left the paved road for some singletrack switchbacks that climbed into the night. I hiked steadily upward, the moon reflecting its iridescent glow to my left, and headlamps strung out like Christmas lights on the switchbacks of the hillside below. Not a bad way to start a race, really. The sky had barely lightened before the climb abated, and we hit the unforgiving half track across the treeless hills of the Marin Headlands. Running downhill on a slanted, narrow trail, still in need of a headlamp, was the first of many unique challenges offered by the new course. I feel lucky to have survived without a fall or ankle twist. By the time we left the open hillsides for the redwoods of the Bolinas Ridge, the sun was up, and we dropped our lights at the Bolinas aid station. 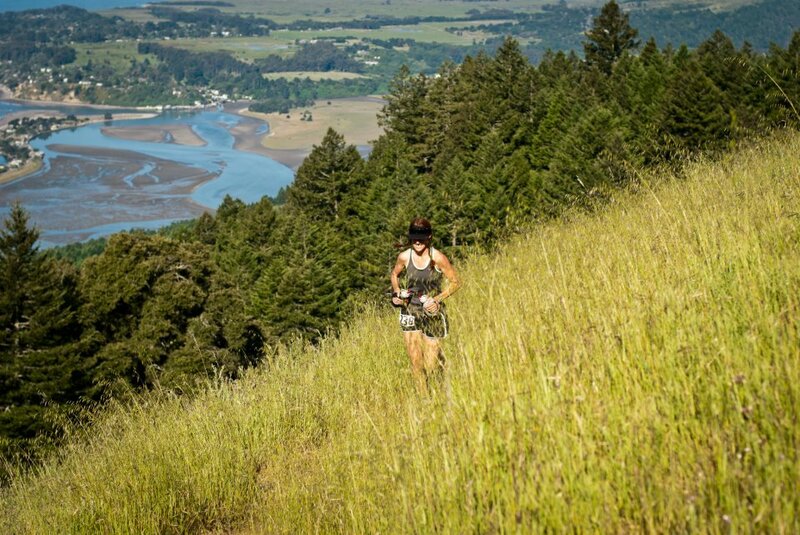 Having the very runnable trail of the Bolinas ridge at mile 6 definitely lent itself to running fast early, and this is not my favorite way to run a race. Neither do I like to start thinking competitively before the second half, but the turnaround at mile 12 was the only opportunity to see where I stood in the women’s field (11th). I tried to force myself to relax and ignore the competition, so when Scott Mills, who was running next to me, offered to take a picture, I accepted. 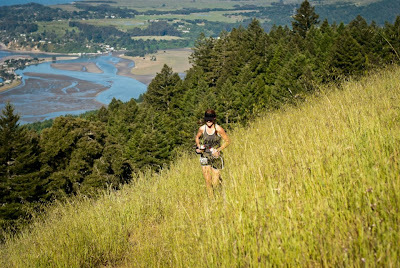 After passing through the Bolinas aid station once more, we were back on the narrow trail of the open, grassy hillsides. This time, with no headlamp required. Returning to Stinson for an aid station visit, we dropped down via a treacherous Matt Davis Trail. This trail was new to me, and it was my first real clue as to how much more challenging this year’s course was. Matt Davis is a study in contrasts. It is heartbreakingly beautiful – enchanted forest beautiful – with tiny blue flowers thickly carpeting the forest floor, huge redwoods, moss covered trees hanging low, a cascading creek, and lush ferns filling in the only spaces without flowers. It was also insanely difficult to run. The steep descent was primarily made via huge stone steps, although occasionally a step was made from a wooden beam which had the added pleasure of being covered with a slick, wet moss. Trekking poles would have been nice. In my head I kept hearing Boromir’s voice from The Fellowship of the Rings asking, “What is this new devilry?” Okay, so I was a little melodramatic. I was tired. But I didn’t want my downhill to come at such costs! I focused on soaking up the surrounding beauty, but at the same time I wondered, would I trade in all this beauty for a section of trail that was more runnable? I hated to admit it, but I think maybe, kinda, sorta, the answer might have been yes. Just a little bit. By the time I’d climbed from Stinson up over the Dipsea Trail and back down to the Muir Beach aid station, I still felt pretty good, but I could see the damage in terms of just how much slower my finishing time would be compared to last year. I hated to focus too much on performance goals, but I felt pretty bummed. I hadn’t exactly been running easy. As I climbed up away from the beach, the day’s warmth began seeping into my skin. It was an incredibly beautiful day, and the scene below of people relaxing on the sand and frolicking in the surf looked far more appealing than the idea of running another 30 miles. I wonder if some nice person down there would share a corner of their towel with me, I thought. Definitely. And the idea gained momentum. I bet they would even share a soda from their cooler. Or a beer! I won’t kid you: I was tempted. But then I remembered that I’m not as young and cute as I used to be, and maybe those invitations aren’t as easy to come by these days. I decided I didn’t need to find out and continued uphill away from the beach. 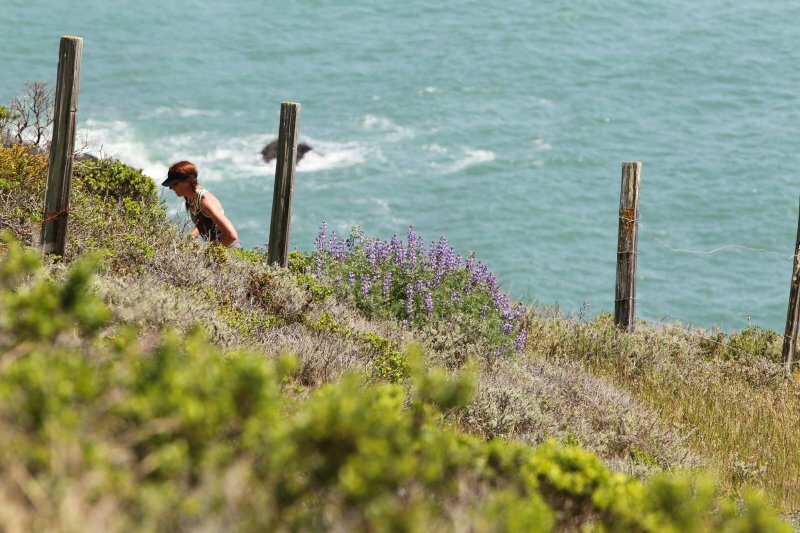 On the long climb out of Tennessee Valley, I caught up with another runner named Steve. He was enthusiastic, and made for an awesome running partner. We chatted about racing and life, and the miles came easy. By the time we reached the traverse with a stunning view of the city framed by the Golden Gate Bridge, we were clipping along at a nice pace. I knew if I could just stick with Steve, I’d have a great race. I passed a few more women while in Steve’s company, and left the Rodeo Valley aid station just ahead of him. We made a left onto some singletrack that was so narrow and overgrown that I had to slow down so I wouldn’t trip over the waist-high grasses. I also noticed that mixed among the grasses and flowers was no small amount of poison oak. There was no avoiding it. Really? Did we have to run through this section? I’m sure the course could have been routed around this half-mile! I’d already had two bouts of poison oak this spring, and I didn’t fancy another go-round. My students think I have some kind of a disease, what with all the red bumps and scratching. A steep downhill ensued, and with my unsteady legs, I had to let Steve take the lead. This was apparently a mistake, as he gapped me quickly. “Don’t leave me, Steve!” I wanted to yell at his receding form. The farther away he got, the more depressed I became. That was nothing, however, to the torture provided by the latest Miwok devilry: the siren song of Rodeo Beach. The heat of the day had reached its zenith, as had the temptation of the Pacific Ocean waves crashing on the sand. The course took us directly across the beach, and I stared, mesmerized, by the surfers, and bikini girls, and little kids building sand castles. They stared back, and I knew exactly what they were thinking: “What the hell are you doing? ?” I wondered the same thing myself. Rodeo Beach: You can see the trail running close to the lagoon and up into the hills above the red roofs. With the finish line only 15 miles away, however, I turned from the prospect of a cold ocean swim, put my head down, and plodded forward through the sand. I could swim at Stinson Beach. I’m quite familiar with the climb out of Rodeo Beach, and this made it a fairly comfortable ascent for me. I started to smell the finish line, and I basked in the incredible ocean views as I climbed. The previous weekend I had run the Big Sur Marathon, which is renowned for its scenic beauty. It's a well-deserved reputation, but honestly, it can't hold a candle to a race like Miwok. Trail runs offer an intimacy with the terrain that a road run could never touch. By the time I reached Tenessee Valley again though, I felt mentally done. It was hot, I was tired, and I had 12 miles still to run. It sounds like nothing now, but at the time it felt monstrous. Luckily, Tim Fitzpatrick was hanging around the aid station, and his support and enthusiasm was enough to at least get my legs moving back down the road again. I broke it down: One more aid station, two big climbs, two big descents. That’s all. Totally doable. I knew the finish would be down the steep Dipsea Trail, and I was dreading it. I managed a solid pace on the climb, but my legs were jelly on the way back down. Since my finish time would be slow anyway, I allowed myself to go easy heading back down toward Stinson. All I wanted at this point was to avoid a tragic fall before crossing the line. When I saw the Dipsea marker that said “Mile 7,” I began to get pissed. Isn’t the freaking Dipsea 7 miles?? Where the hell is the finish line? I finally burst from the forest directly onto the beachfront park and crossed the line in 11:49, wide-eyed, a bit shell-shocked, and incredibly relieved to be done. I collapsed onto the grass next to the awesome Benna family. Jen immediately began sympathizing with me about the difficulty of the course while J.B. ran off to get me an ice cold Coke. Oh running friends, how I love you! Based on my finishing time, I had a very comparable race to last year’s. By most accounts, the front of the pack finished about 1:15 slower than in 2011. I finished 1:06 slower. I finished 7th woman – exactly the same as last year. The race also capped off a 110 mile week of running – basically unheard of for me. It seems silly, then, that I was thrilled with 2011’s performance but disappointed by this one. I’m well aware that it’s simply a difference in expectations: I’d been hoping to improve upon my time. Clearly that was a naive desire, but there was no way to know that going in. This version of Miwok turned out to be a much better training run for Hardrock than previous renditions of the course. It also turned out to be another experience that was so tough, it made me question how capable I am of crossing that finish line in Silverton. Honestly, I don’t think having these doubts is a bad thing. The questioning is part of the preparing, and if I felt totally confident I could finish that race in July, it wouldn’t hold nearly the same draw for me. After downing a second Coke, I wandered out to the beach for the promised Pacific Ocean swim. I spent the next several hours cheering for friends, both old and new, and passing out finishline hugs. Not a bad way to end a race, really. Thanks to Tia and all the volunteers for this year's amazing version of this NorCal calssic! When one of your dearest friends, whom you haven’t seen in years, has what we like to call “a significant birthday,” and her plan to celebrate involves you, the California coast, and a long run … well, it’s a sure sign you’ve made (and kept) the right friends in your life. Charlie and I go way back to my freshman year of college and the rather naïve age of 17. She was that elusive training partner that we all seek – the one who can match you stride for stride, who pushes you, who competes next to you, who understands you because in many ways she is you. College track and cross country was a springboard for our friendship, but it was also at the heart of it. We are runners, both, whether we have been running many miles or very few. When discussing possible race choices for this birthday event, we settled on Big Sur largely because it’s considered to be a slow course. We figured if we could let go of the desire to run a PR, we’d have no issue running together even if our training put us at different ability levels. Back in the old days, Charlie and I trained for, and ran, our first marathon together. We did the same at our second marathon. There was no question then that we would run together and that our best efforts would match, no question of someone needing to run ahead, and no question of wanting to push ourselves. Of course we ran our hardest! That’s simply the way it was. Sixteen years later, and our only goal is to run together again. Sixteen years of changing jobs, different houses, marriages, kids, periods of intense running, and periods of time away from running. It wasn’t about speed this time. It was just about us. 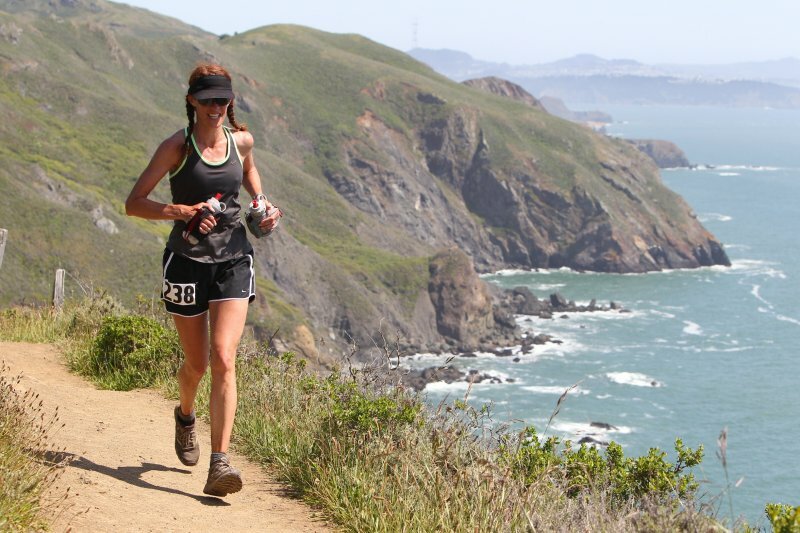 Big Sur offered the perfect opportunity: a beautiful setting with no need to worry about running fast. By the time race day rolled around, Chuck had spent most of our training months emailing me with updates about her calf injury. Mileage for her had been minimal as a result, but I really never questioned whether she should be trying to run a marathon on so little training. She was the girl, a year ahead of me in school, who had always set the example for me of exactly how to be a badass. There was simply no way she wasn’t going to run this race with me – she was my own personal map to badassery. The 3:00 A.M. wake-up would have been normal for an ultra, but it seemed unusually cruel for a marathon. Also cruel was trying to cram the entire marathon field into a rather small parking lot for an hour where the only entertainment was waiting in line for the port-a-potties. I did manage some good people-watching, noting attire choices like Sponge-Bob pajamas, numerous colorful tutus, your standard garbage bags, and one man keeping warm in what was clearly his hotel bathrobe. And people think ultrarunners are weird. Yes, this was really the line for the port-a-potties. Given Charlie’s concern about even being able to run 26 miles, I took the ultrarunner’s approach and planned on a strict 10min/2min run/walk schedule. We lined up in a conservative position between the 5-hour pace group and 5:30 pace group. As far as I was concerned, we may as well take our time, enjoy the scenery (and excellent company), and (hopefully) not further any injuries. So far back, you can not even see the starting line. That's because we are smart! Soon we were off on the best possible mode of transportation for exploring and adventuring. I vowed from the beginning to take pictures of everything I saw, but one thing I had a hard time keeping up with were the musical acts; there were so many! However, if there's one thing I love, it's kids playing music, so I did not miss this first act - a high school band showing their stuff! Here's the super awesome River Inn that let us all in to use their bathrooms. I think perhaps that's the privilege of being at the back of the pack. The fast people were too impatient to ask. The mile markers were all decorated with plywood scenes, some of which were pretty funny. Whoa, slow down there, Charlie! With our run/walk schedule, we played leapfrog in the first several miles with the 5-hour pace group, which was being led by ultrarunner Whit Rambach. I wand to sidle up to him and grill him with questions about Hardrock since I knew he'd finished it, but as seems to be typical in these road marathons, things were particularly crowded around the runner with the pace sign. He was also busy playing tour guide, pointing out various sights and landmarks - a definite advantage to having a local as a pace leader. Whit guides his group to a 5-hour finish. We ran along feeling good, enjoying the scenery and the rising sun. This highway sign wasn't really a good gauge of distance since we were already 5 or6 miles into the race at this point, but it seemed appropriate that it would be a marathon to get back to our hotel in Monterey. I was thinking perhaps a run to Santa Cruz might be nice? And then, a quarter mile later, it all made sense. I'm giving them jazz band status vs. marching band, based on their numbers and instruments. They're the rock stars of their school. They were pretty much rockin' out when we ran by. As we neared the coast, we began to encounter fog, hills, and headwinds in earnest. The only problem was, I thought it was so funny that it raised my expectations for the rest of the signs, and none of them could live up to this one. That just shows you what my sense of humor is like, I guess. The next hill looked pretty intimidating from a distance, but we tackled it without too much trouble. It was long, but not terribly steep. The rhythmic sound from these drummers kept us energized all the way up the hill. I wondered if their arms were getting tired. I figured if they kept up that much drumming during the entire race, they were getting as good a workout as we were. Maybe better. I love these guys. When I was in high school, I thought the band kids were all geeks. Now I think they are completely awesome. I think maybe I'm the geek. We finally came upon that famous bridge. You know, the one all those pictures? We got a race program at check in, and I counted no less that 15 pictures of this bridge in it. These guys like their bridge. But I thought it was going to be one of those things that makes a great picture from a distance, but when you're actually running across it in the race you can't even see it. Turns out, not so. My favorite part was the realization that all of us weren't just runners - we were tourists. Looking around, I saw that nearly everyone stopped for a picture at this spot. I loved it! I wasn't the only idiot with a camera; we were all idiots with cameras! I wondered if people at the front of the race were stopping to take so many pictures. I knew right then, that this was the best way to do this race: slow, and smiling, and soaking it all in. "Ooh, will you take our picture?" "Sure, will you take mine?" We could hear the piano music floating across the water long before actually crossing the bridge. And what was he playing? The Peanuts theme! I love the Peanuts! I danced my way right onto the bridge. Exactly halfway across the bridge was the best moment of the entire day. There was a small crowed of runners stopped in the middle, cameras out. I followed their collective gaze to see a man down on one knee in front of his girlfriend. The crowd erupted in cheers and applause. She must have said "yes!" By the time I got my camera out, he was slipping the ring on her finger, and we were all still cheering. I get pretty sentimental over things these days, and this scene had me smiling and crying and loving this race. I love love! The happy couple immediately post-engagement. She looked so happy and completely in shock. It was awesome! The Peanuts were still rockin' us down the road, and it was at this point that I let loose with the following speech. "You know, I really wanted to run this race when I was in high school. But then, after I became a trail runner, I couldn't figure out what all the hype was about. I was totally stuck up about it and thought this race was completely overpriced. Like, why would anyone pay that much money for just a marathon? But you know what? Now? I take it all back. I TAKE IT ALL BACK! I LOVE THIS RACE!! 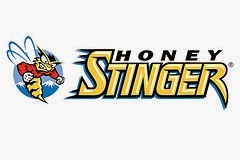 Wooo hoooooo!" I waved my arms in the air as I yelled, and Charlie joined me, smiling and waving and yelling in joy. Eventually, we started pushing the limits of Charlie's training, and she decided it was time to stop and stretch out the hips. Not a problem. This picture kind of reminds me of that time I laid down in the trail to take a nap at TRT. I don't remember what song this band was singing, but they were rocking out, and he was totally singing right to me. I became and instant groupie! Beyond mile 17 was what Charlie kept referring to as no man's land. Seventeen miles was the longest training run she had completed in the last five years, according to her detailed record keeping. I think she managed one other long run in her training which was 10 miles. Not exactly high volume. She figured anything could happen after this point in the race. What happened? We kept running. You know the only thing better than a bunch of high school band kids? A bunch of middle school band kids! After this point, it became about just crossing that line. It was clear we were going to make it, and I was impressed that Charlie hadn't needed any more than our regularly planned walking breaks. You did catch what her training had been like, right? Yup, that's my road map to badassery right there. Although at one time this race sat atop my dream list, I'm glad I never ran it until now. This was exactly the way to do Big Sur - with a camera, a relaxed pace, and a good friend.